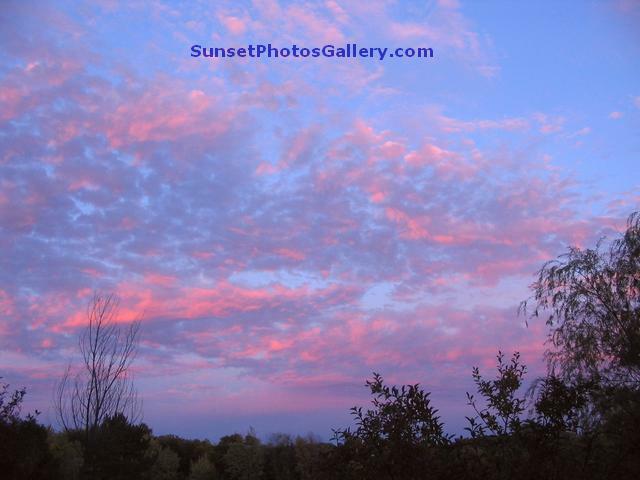 All pictures on this Colorful Sunset Photos Gallery + Colorful Sunrise Photos page are Copyrighted, but you are welcome to use them by following the free download instructions below. 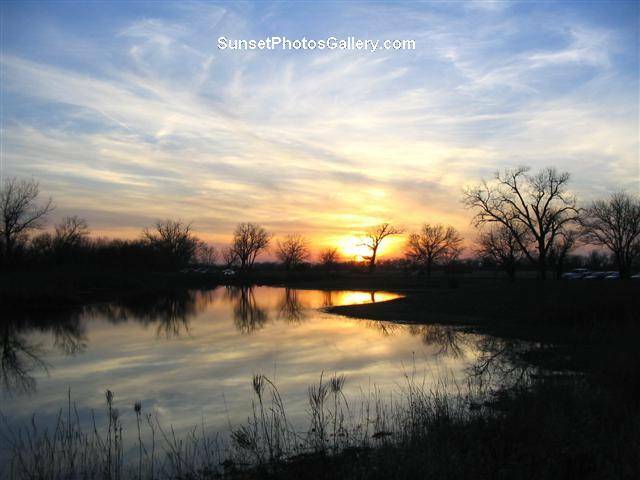 - Or - for non-Watermarked High Resolution file size Images + Free Downloadable Sunset Photos Gallery Wallpaper & Screensaver Image Versions, see bottom of page. 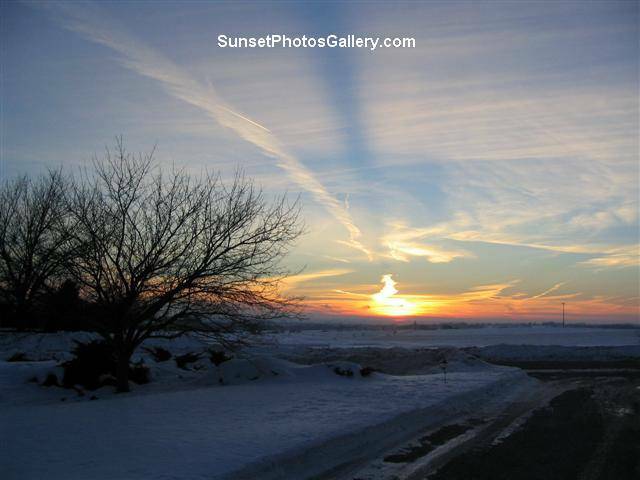 near Grand Island, Nebraska) - Midwest US - Great Sunset Photos Gallery addition. series of 3 sunset photos below. + Photo selected to be on a upcoming Calendar! 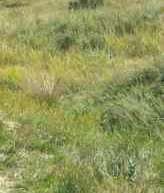 -- actually the gravel road that runs in front of our acreage! 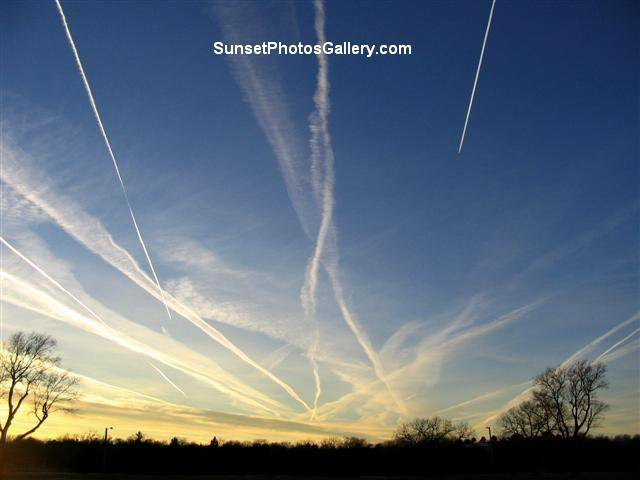 when the sunset sun was lower and turning clouds and jet trails red color. near the same spot as the #1 photo above except taken slightly to southwest. 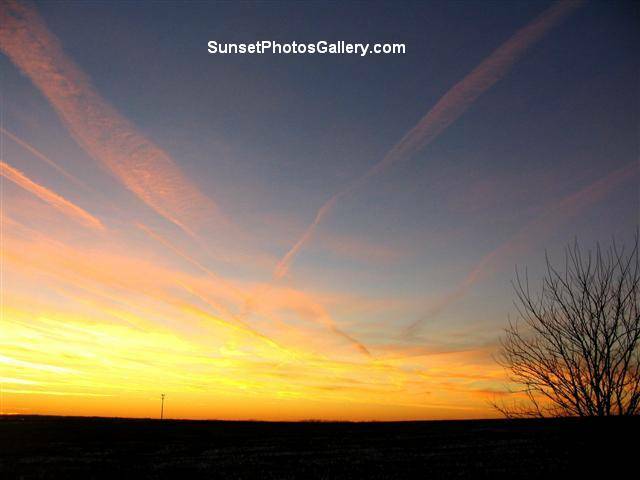 red & orange color jet trails in slightly cloudy purple-blue sky - beautiful peaceful Midwest scene. This photo has been chosen to be on a Calendar to be printed in a few months! 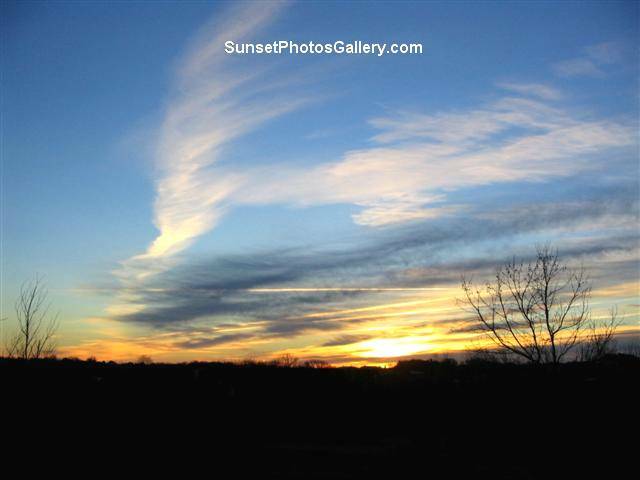 The photo above is the 3rd on this page taken of the same changing colorful sunset - It was taken about 35 minutes after the 1st "MANY White Jet Trails" sunset above. 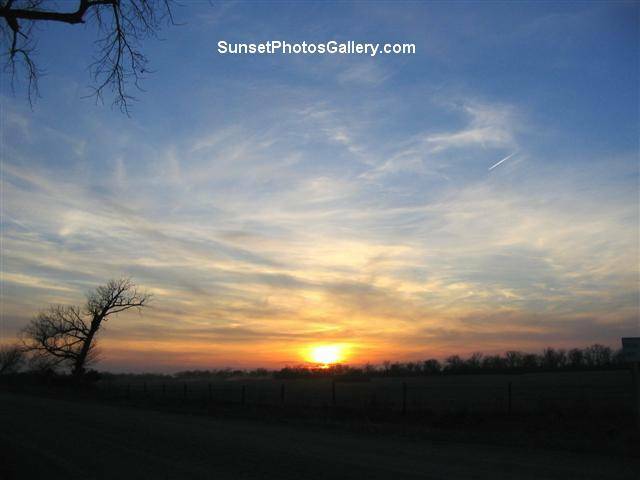 Had decided I was finished taking photos of the colorful sunset and was walking up the driveway toward the house on Dec 11, 2005. 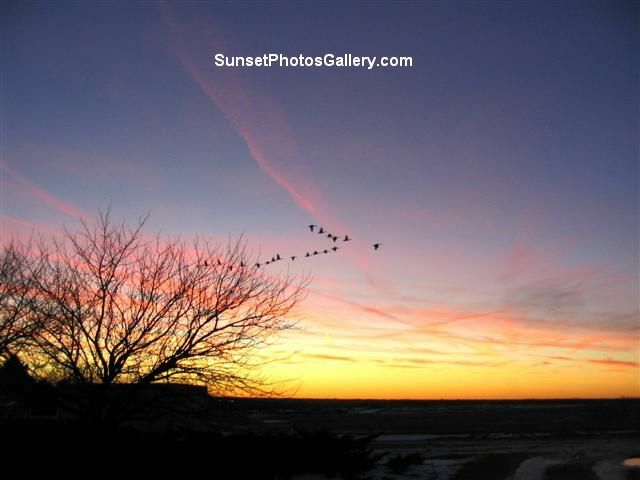 Had stopped to take a couple shots of the Christmas decoration lights in the front yard which had just clicked on with the timer, when heard the geese "honking" and turned around and got this "Flock of Geese Flying at Sunset" picture. A minute later and would been inside and missed this great Photo!! 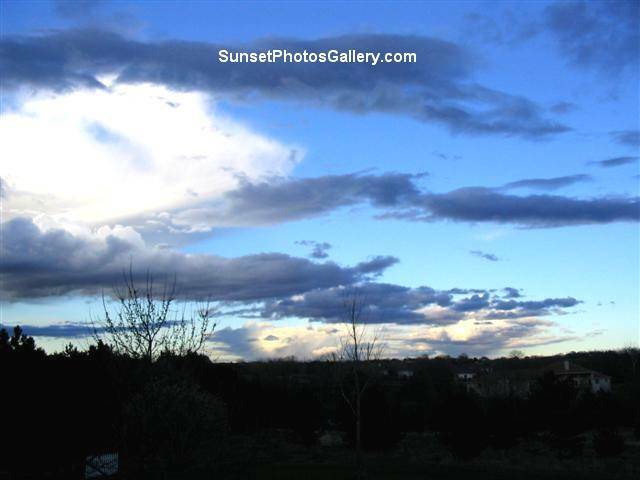 are now available on this Photos Page. "Comp" Downloads are also available. 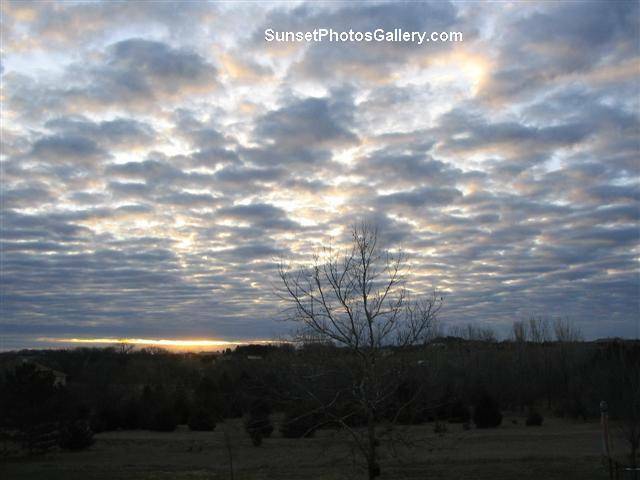 Sunrise Sky -- This photo taken at 7:26am when this December Sunrise was just starting to appear. Taken to east from deck on an Eastern Nebraska acreage. and the colors faded. Shows why you have to take several Photos of fast changing events! -- on another of our 4 US Vacation Guide Sites (Links below). 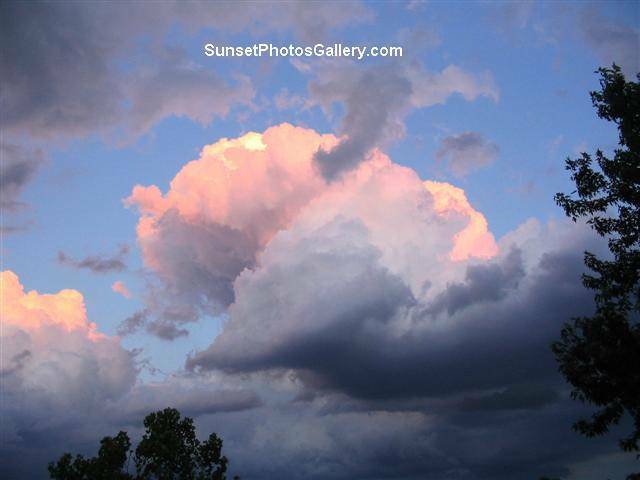 are available at the High Resolution Photo Previews link - Direct to High Resolution Photo Previews. 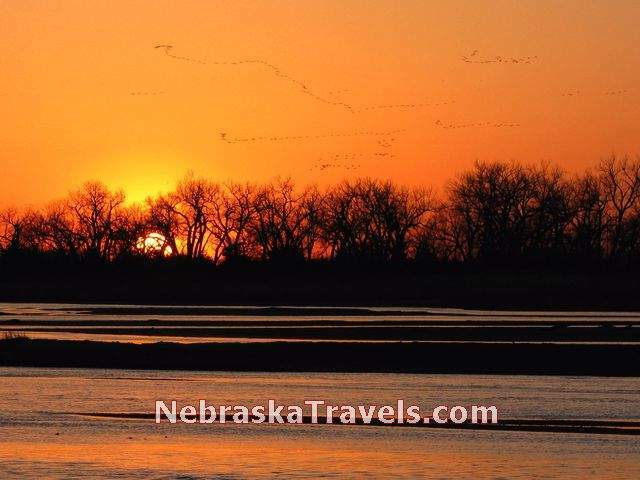 Sandhill Crane Migration - Pictures, Viewing Location Tips & Viewing Blind Tour Info, Crane Links, + Video of thousands of Cranes flying in to roost for the night on the Platte River at Sunset and their unusual sounds! 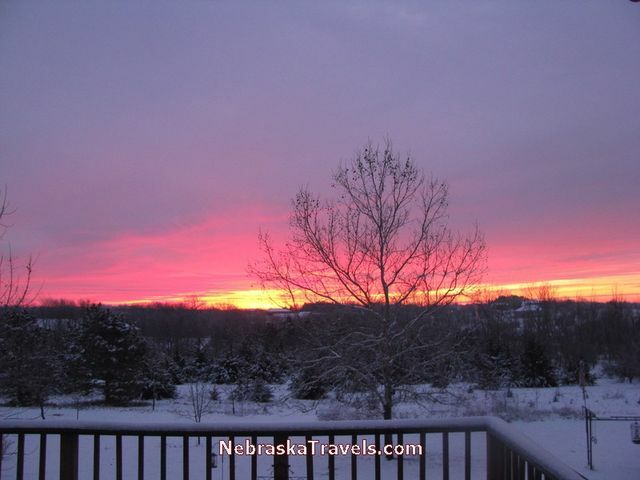 Near Grand Island and Kearney, Nebraska. 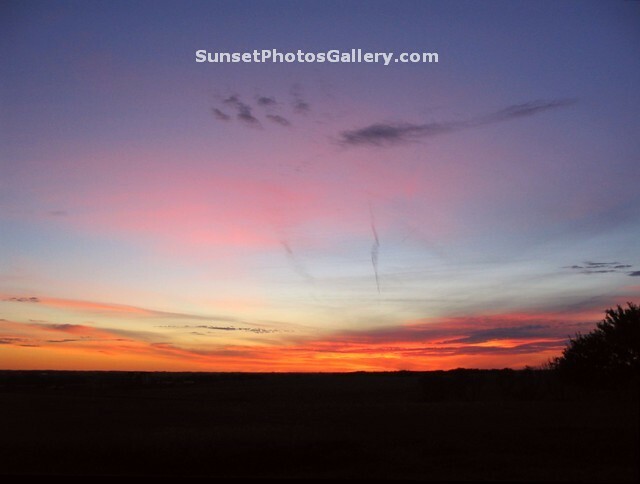 See these High Resolution Photo Preview pages where non-watermarked high resolution photo downloads from all 4 of our US Vacation Guide Sites are available. 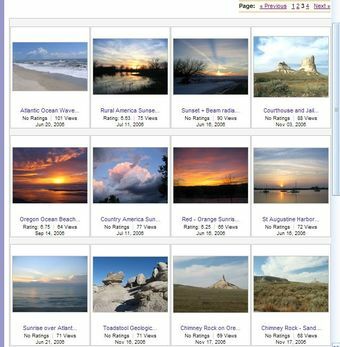 If you are a photographer and would like to sell your Images online at a VERY popular Stock Image Site, see more Info on setting that up at this link - Sell your Photos Online (Web page loads and then drops down to Selling Your Photos Info) - You set your own image prices which is different than many Stock Photo Downloads Sale Sites. Use this easy to remember and type in to your browser - gousvacations.com - link to check out all 4 of our "Picture Enhanced" Affordable US Vacation Guide Sites! 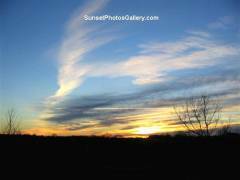 Come back and watch our growth -- and to check our our new Picture and Video postings! To Road Trip Vacation Pictures and comments about a Scenic and Colorful Fall Blue Ridge Parkway Vacation Road Trip - Fall Vacation Photos and Tips - "Must See" US driving tour - a Fall Getaway Vacation. 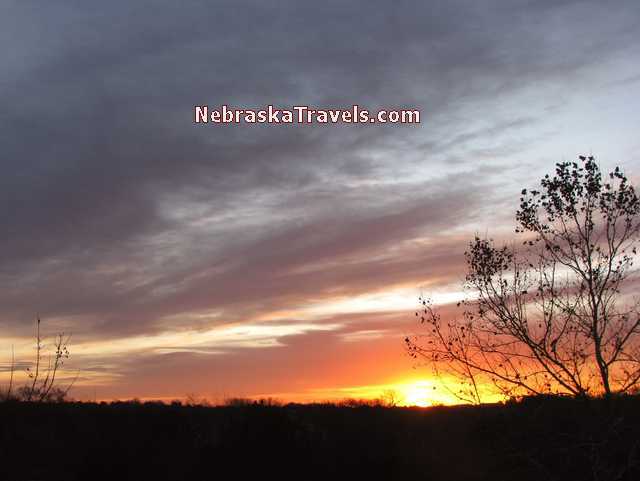 Thanks for dropping by -- come back and visit us soon for Info & Tips on your next Affordable Nebraska Travels -- or to check out our latest Nebraska Sandhills & other Nebraska Sunset Photo Gallery additions! 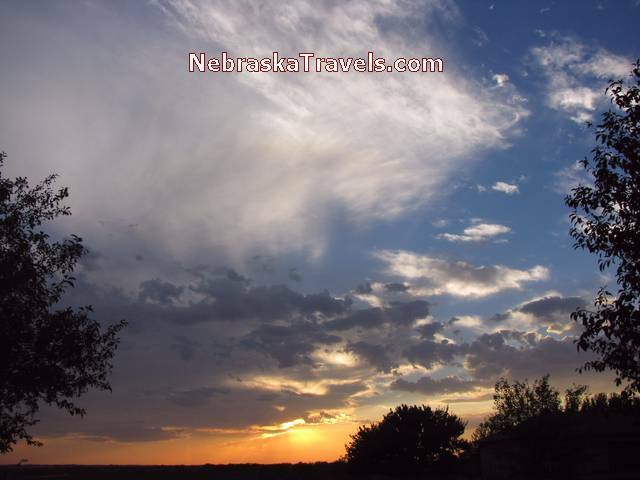 Gene always appreciates your suggestions, questions, or comments for this Nebraska Travels Site or any of his four US Vacation Guide Web Sites. 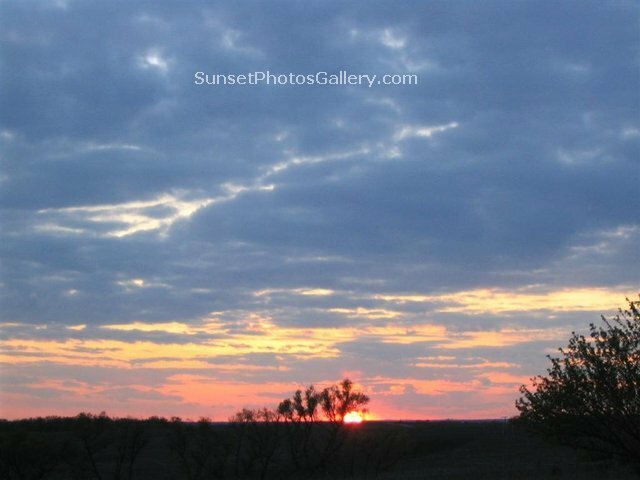 Use our easy Gene Seecann Sites Comment Form Page -- You can also share your own favorite Western Nebraska Travel + Scottsbluff NE and Nebraska Sandhills or Panhandle and Chadron, Nebraska Attractions or pictures. We appreciate your comments and feedback! We will not share, sell, or spam your email address -- Promise!!! -- we hate spam as much as you do! 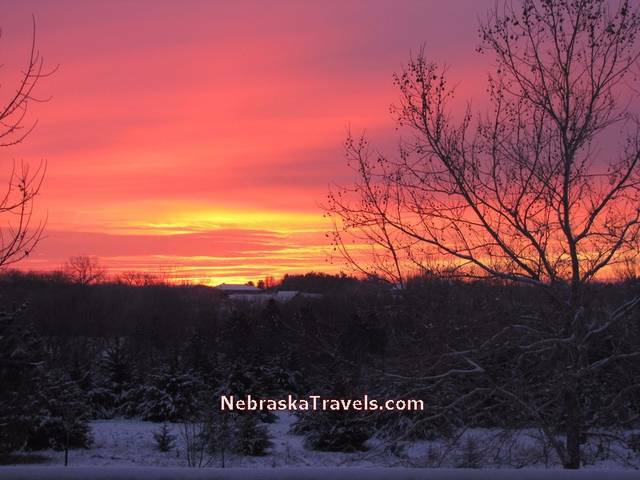 Feel free to share your Nebraska Travels, Nebraska Sandhills, or Nebraska Sunset favorites or pictures. We and our Site Viewrs always enjoy pictures if you would like to share. If you give us permission, we might use one or more of them on this Web Site. 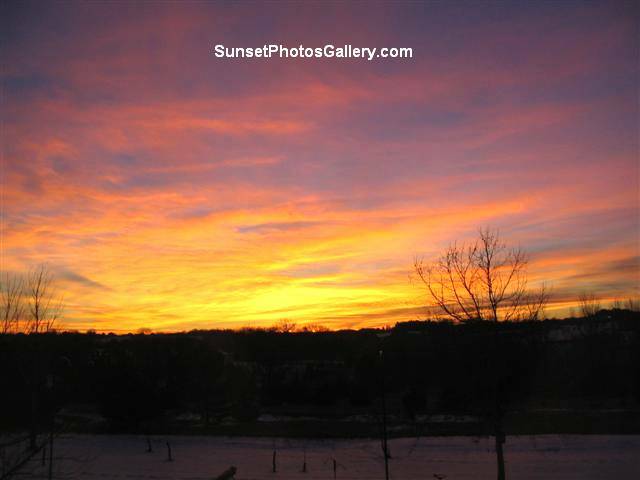 Please let us know if and/or how you would like to receive acknowledgment for your photo. We will e-mail you if we decide to use any of your photos. Looking for something Specific that's not here yet? Search two of our other US Vacation Guide Sites. We will not share, sell, or spam your email address! - Promise! - We hate Spam too!